Back in the early 80s, WLIR--the modern rock/new wave/post-punk station on Long Island that broadcast to the New York City metro area (and which brought a host of truly amazing and much needed music into my drab and unhappy adolescent life)--played a fair amount of angular, white-boy, post-punk funk from bands like APB, Gang of Four, Heaven 17, early Ministry, and many others dabbled in this style, from The Clash, the Talking Heads, to Duran Duran. And since new wave served as an umbrella for a host of non-pop-mainstream genres (and there was much more of a willingness for bands to venture into other genres then), I was exposed to--and loved--a lot of different types of music and bands. However, later that day I looked up "Run Me Down" on YouTube and upon hearing it instantly recognized it as one of those post-punk funk songs that WLIR played the hell out of (though I never knew the name of the band that performed it, since the DJs didn't always announce the songs they played). It's track that I really liked then and one that now is very much a new wave classic (at least in the NYC area for a people of a certain age!). So, the next day, during my lunch break, I rushed over to the record shop and was relieved to find that no one had snapped it up (according to Discogs, the 7" single of this release is very hard to find, though the 12" version is still to be had). 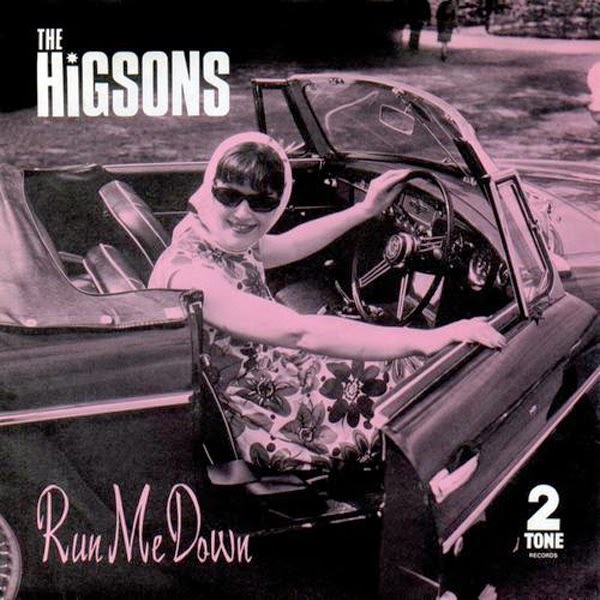 "Run Me Down" is a brilliant rejection/put me out of my misery song--something I could relate to back then--but one with wry humor, a great groove, and you have to love the female backup singers' work here (listen to the song below)! So, why hang on to something that's dying? Why won't you let me join them? So, why hang on to something, something that's dying? I wanna see it, I wanna hear it, I wanna live it! You should have run me down"
The Bodysnatchers at the top of the heap! Dub Champions Festival w/Victor Rice (mixing Dub Side of the Moon), I Grade Dub, Tsunami Bass, Analog Players Society, Liondub, Jr. Volcano and more! Beat Brigade, Rude Boy George and special guest! After re-reading sections of Paul "Willo" Williams' essential "You're Wondering Now: The Specials from Conception to Reunion" this past August while on holiday, I came across a passage about Specials' drummer John Bradbury's short-lived label Race Records that he ran with Sean Carasov, who was the manager for the all female punk band the Mo-dettes, as well as a roadie and merch guy for The Specials. 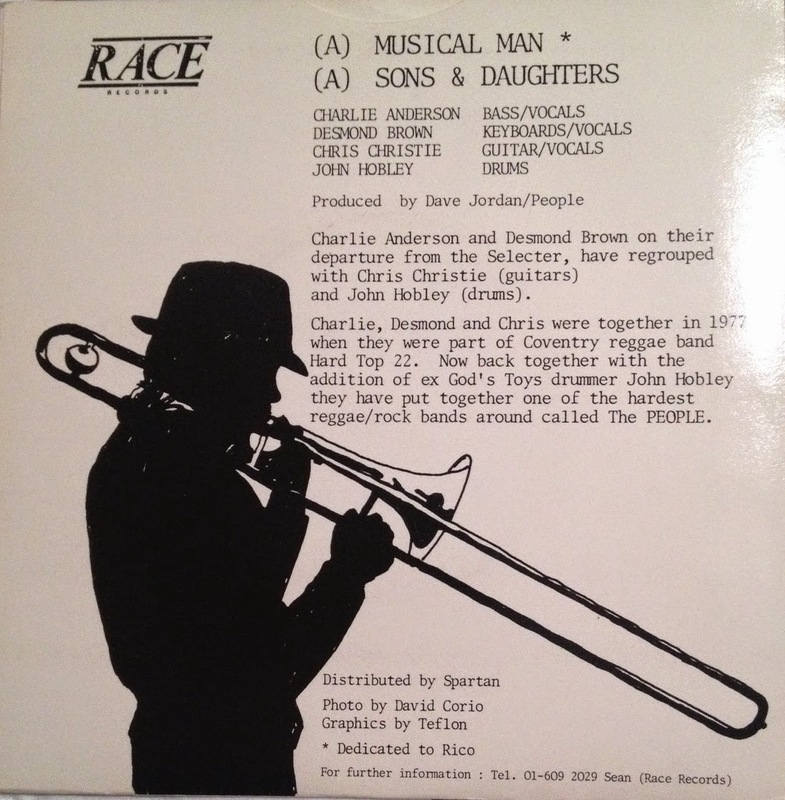 One of the acts on Race Records that caught my attention was The People, which featured ex-Selecter members Charlie Anderson and Desmond Brown, who had left The Selecter before the recording of Celebrate the Bullet (according to a 2009 interview with Marco on the Bass, Anderson "didn't think it was the right direction for the band"), as well as Chris Christie, who had been in the Coventry reggae band Hard Top 22 in 1977 with Anderson and Brown (along with several other members of The Selecter), and John Hobley from another Coventry band, God's Toys. 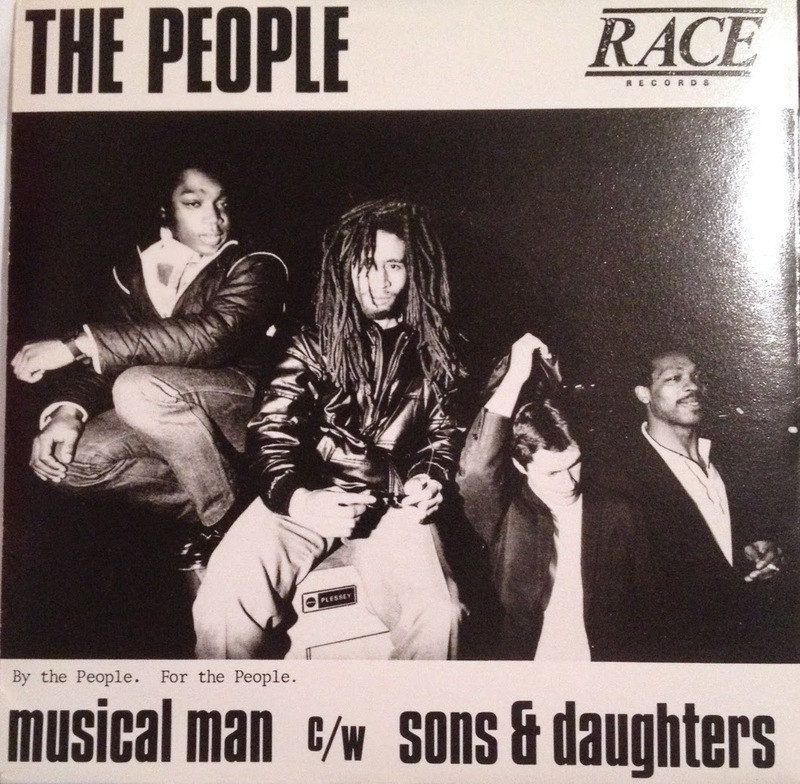 The People's sole release was a 1981 single: "Musical Man" b/w "Sons and Daughters." I was intrigued, so I looked up the A side "Musical Man" on YouTube and really liked its reggae/rock sound, which--ironically--wouldn't have been out of place on The Selecter's Celebrate the Bullet--compare the (slightly psychedelic) reggae of "Musical Man" with "Selling Out Your Future." So, I decided to try to track a copy of the single down on the internet. As luck would have it, I was able to purchase a near mint copy of the single for not too terrible a price and am psyched to have this somewhat rare release in my collection. In addition to the fantastic songs, what makes The People's single particularly compelling is that it's clearly a 2 Tone affair (even if The People's sound isn't). Specials' engineer/producer Dave Jordan produced it (and according to Anderson, Lynval Golding was also involved, though he is uncredited on the release), John "Teflon" Sims designed the artwork (and the illustration on the back of The People's single--the A side is a tribute to Rico--is reprised and further developed for Rico and The Special AKA's "Jungle Music" single picture sleeve, which was issued in 1982), and it was released on Bradbury's imprint (he had set it up as a "musicians' label," according to Paul Williams, lending each band the money to record their music, recouping his loan on sales, and if the release went bust, he forgave the band's debt). 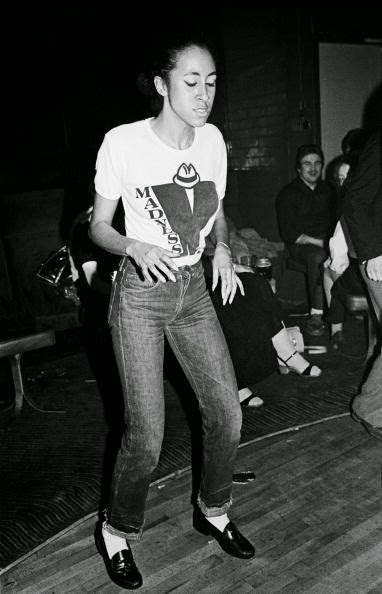 And we're thinking about their future"
Ska Crowd Funding: Rhoda Dakar of The Bodysnatchers! Rhoda Dakar demonstrating her moves. 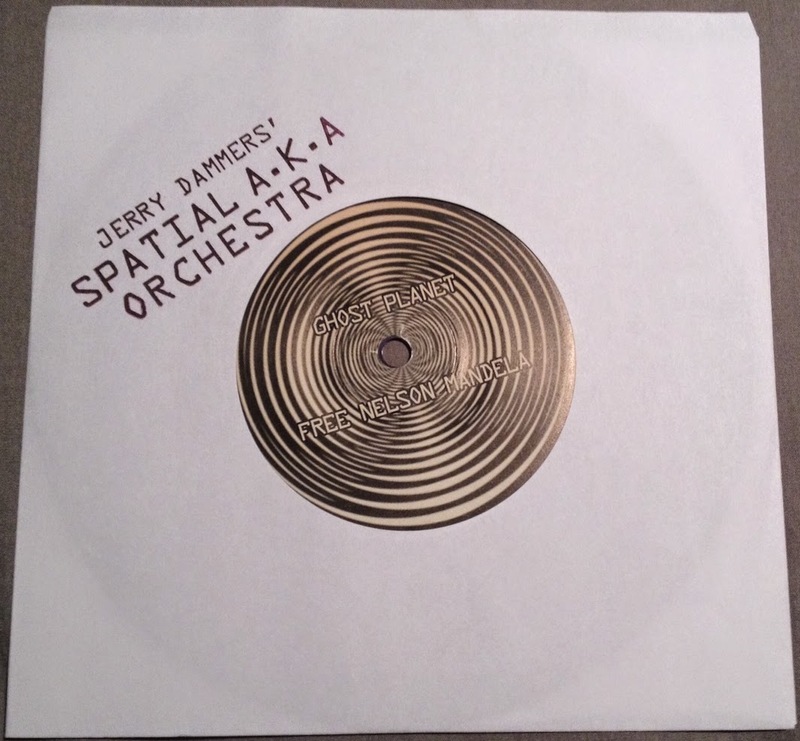 Here's an interesting ska crowd funding project that we're planning to support! In recognition and celebration of The Bodysnatchers' 35th(!) 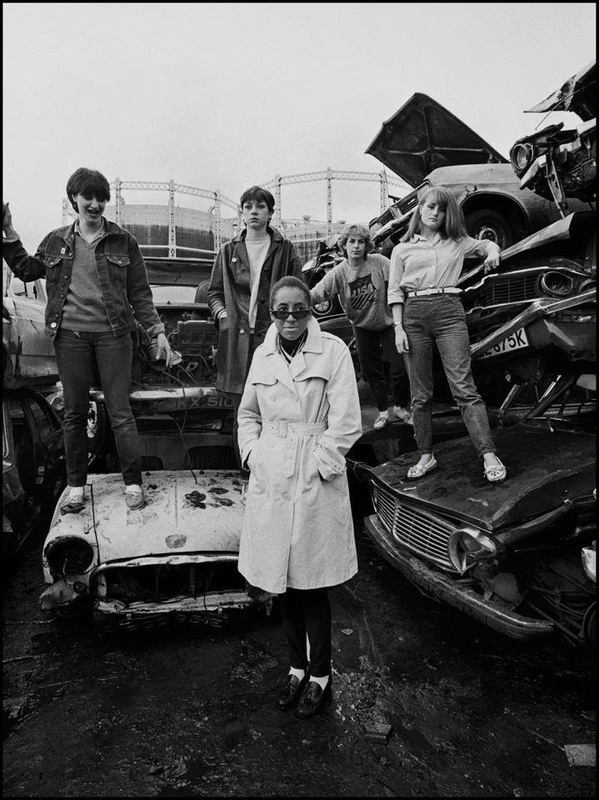 anniversary (it's important to note that they were 2 Tone's only all-girl group), vocalist Rhoda Dakar is recording an album of unreleased and unheard Bodysnatchers material, most of which she wrote or co-wrote back in the day. (Dakar stresses that The Bodysnatchers are NOT reforming, this is her project in tribute to the band--think Rhoda Dakar sings The Bodysnatchers' unreleased songs.) If you're interested in funding this project, there are digital downloads, CDs, vinyl records, etc. available at various pledge levels--all the details are available on her PledgeMusic page. Word from Sean Flowerdew via the Specials' fan site is that these songs will be recorded with a full band and produced in a manner that will attempt to be faithful to The Bodysnatchers' original sound. And when I checked in with Ms. Dakar, she confirmed with me that, indeed, the songs will be captured in the studio with a full band, but due to the tight deadline and availability of musicians she's asked to accompany her, she's understandably reluctant to announce who else may be involved in her project until the album is in the can. Apart from two great singles ("Let's Do the Rocksteady" b/w "Ruder Than You"--which was co-written with Gaz Mayall before he became a Trojan--and "Easy Life" b/w "Too Experienced"), a track on the soundtrack to the 2 Tone film Dance Craze, and inclusion of these songs on various 2 Tone compilations, The Bodysnatchers didn't leave much recorded music behind after their break-up (of course, Rhoda went on to join The Special AKA, while other members went on to form the pop group the Belle Stars--and this band later begat the brilliant ska group The Deltones in the late 1980s). So, this is an amazing opportunity to see what might have been, had The Bodysnatchers soldiered on after the flame out of 2 Tone mania in the UK, instead of dissolving. Also, if you're in the UK, Rhoda Dakar will be performing a one-off show of these songs at an "Invasion of The Bodysnatchers" gig at Camden Town’s legendary Jazz Cafe this coming Halloween. 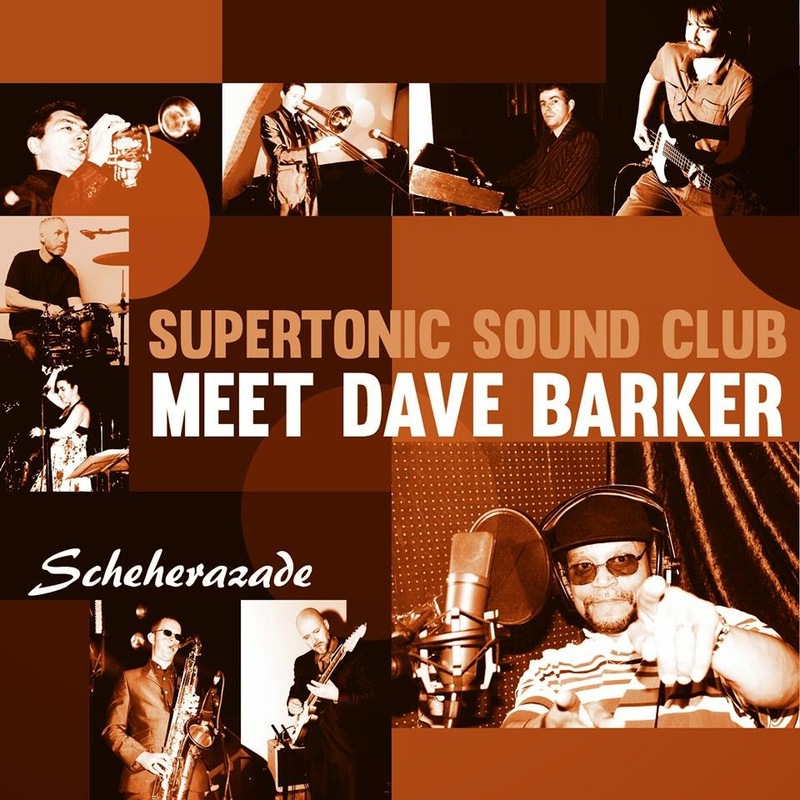 Duff Review: Supertonic Sound Club Meet Dave Barker "Scheherazade" b/w "Little Boy"
Became his queen, his love, and, yes, his life"
Will you ever be at peace? Can you find the release? The Supertonic Sound Club are clearly a gifted and thrillingly original band. Get this single and keep your eye on this band--you're going to want to hear what they do next! The Jamaica Observer is reporting that rocksteady great Hopeton Lewis passed away at age 66 yesterday (9/4/14) at his home in Brooklyn, NY. Lewis also won the 1970 Jamaica Song Festival with the Duke Reid-produced "Boom Shaka Lacka" (Treasure Isle) and scored another big seller in 1971 with "Grooving Out on Life" (Duke Records/Pama), backed by Byron Lee and the Dragonaires. 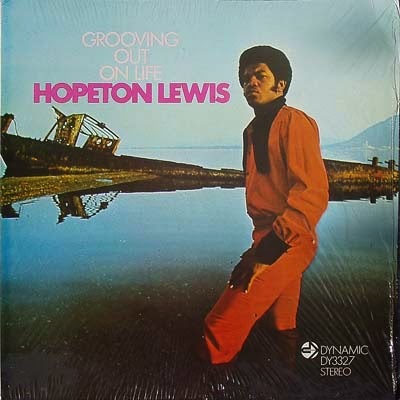 Lewis continued his partnership with Byron Lee, releasing two albums, 1973's Grooving Out on Life (Dynamic Sounds/Trojan) and 1974's Dynamic Hopeton Lewis (Dynamic Sounds). However, according to "The Virgin Encyclopedia of Reggae," "the songs proved to be too lightweight for the reggae audience and he similarly failed to cross over into the mainstream." In the 1980s, according to the Jamaica Observer, Lewis "turned his back on secular music" and became deeply involved in gospel music in New York City. According to his biography on his website, "in 1996, Lewis released his debut gospel CD, This is Gospel and he has since released twelve other gospel CDs." Lewis was founder and president of the Songs for 4Life Ministry, which is "a gospel music production, marketing, and promotions ministry." This ministry includes The Hopeton Lewis Caribbean Gospel Music Awards USA and the Caribbean Gospel Jubilee (CGJ) internet radio station. Our sincere condolences go out to Hopeton Lewis' family, friends, and colleagues. Heather Augustyn has a nice tribute to Lewis on her Foundation SKA blog. 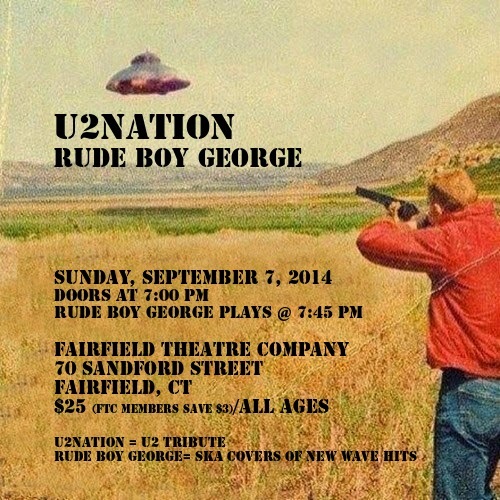 Rude Boy George in Fairfield, CT This Sunday (9/7/14) with U2Nation! Friends in the NYC metro area, come see the band I'm in--Rude Boy George (we do ska covers of New Wave/post-punk hits)--play this Sunday night at the Fairfield Theatre Company in Fairfield, CT with U2 tribute act, U2Nation! 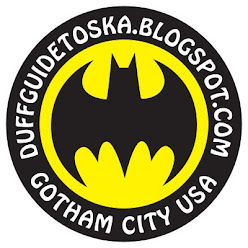 New Yorkers can take MetroNorth, since the Fairfield station is right next door to the theater! We go on around 7:45 pm, but get there at 7:30! Hope to see some of you there!